Highlight : We can fulfil your dream of flying like a bird…. Highlight : Come Drive an All Terrain Vehicle (ATV). Adventure Through the Countryside, Forests,see Mountains View Point in Chiang Mai of North Thailand! Highlight : Spend a great day mountain biking in Northern Thailand’s premiere National Parks. We run daily Mountain biking trips from Chiang Mai into the nearby mountains. They are fantastic mountain biking tours based from Chiang Mai City. We pick you up at a reasonable hour and head for the trails and mountain tops for a great day of mountain biking. Highlight : Chiang Mai with its enchanting location on the banks of the Ping River is surrounded by mountains, rice fields and lush countryside. Chiang Mai Biking is pleased to share hidden places of Chiang Mai with you during one of our recreational, cultural and educational cycling adventures. Highlight : The Cliff Top Adventures Tour is an ideal teeny business gathered by adventure sport lovers and makes every day jobs as family life style feel of work place as home. Highlight : Maetang River runs north of Chiangmai and offers the full spectrum of emotion. The journey begins at the narrow point of the river with level 4 & 5 white-knuckled, wide-eyes, tumultuous rapids. This river and its canyons offer a truly adrenaline pumping rush down the rapids. Highlight : Enjoy the beauty of the local landscape when trail ridding with us first ride or experienced event. You will enjoy your day. Be at one with nature and take back home memories. You will treasure forever.. Highlight : Shooting course with real Guns and real bullet at a standard Shooting range, with expert trainer. We has various type of guns to choose from. We have experienced instructors who are avialable free of charge to provide correct and safe methods of shooting. Highlight : Welcome to Chiang Mai Fishing Park. Most Chiang Mai anglers enjoy their fishing in river, water reservoirs and artificial lake- fishing park. Enjoy learning then do it youeself under the care of the trainer. Good teacher can improve your fishing skill speedily. Highlight : We entertain all levels of kayakers and provide free lessons for beginners, all safety gear is provided and all trips are fully guided. Take a moment to review the set program, feel free to contact us for the optimum nature trip for the present water conditions. Bamboo Rafting in Mae Wang river is one of the most famous excursions that you really should try while you are in Northern Thailand. 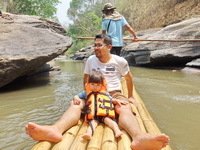 Let’s start with the raft, bamboo made-off, 4-5 meters long, engineered to stable while passing river’s rock stair. Water is crystal-clear, cold and not flow too fast. Impress your unforgettable. 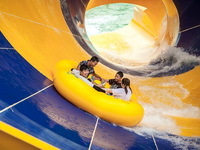 Tube Trek Water Park is a perfect place for every members in a family to have fun together, as there are many playthings. You will enjoy them so much that you forget about hot weather.